7/25/18 - Lumber Company finished 4th in the 18 team Joliet City Tournament. LC was 3-2 on the week. Following 2 run rule wins on Monday night, Lumber Company dropped their first game on Wednesday, in a final four undefeated match-up, in a early evening contest to The Crowd, the bats just never got going. The final was 13-2. Lumber Company rebounded with a 23-16 win against a tough Sidelines team in game #2 on Wednesday. Finally the Lumber crew exited the tourney, playing their third game in 3 hours on Wednesday night, losing to a young, fiesty, motivated O'Charley's team 16-10 (side note: a young, fiesty, motivated team was good to see). 7/23/18 - Lumber Company won their first two games in Joliet City Touney action on Monday (7/23). 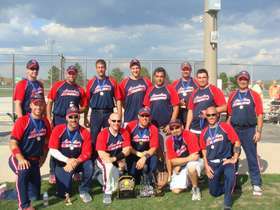 First beating a hard hitting IBEW Local 176 team by the final score of 29-16 in 6 innings. In their round two match up, Lumber Co. beat Anthony's Bar & Grill in 4 innings, 23-8. After two run rule wins to open JPD play, Lumber Co. is back in action on Wednesday (7/25) at 6:30pm on field #1 in a final four undefeated match-up, against The Crowd. 7/20/18 - Lumber Company opens play in the 2018 Joliet City Tournament on Monday, July 23 at 8:30pm on field #4 against the winner of IBEW 176 vs. NI Steel. There are 18 teams in this year's tourney. Check back all week for updates. The entire tourney scheudle can be viewed by clicking on the following link. *click this articles headline to view the entire bracket and all JPD City Tournament Scores. Lumber Company's 2018 tournament schedule is as follows. We may look for a 35 or 40 and over tourney as well, most likely in early fall. More to come. Home of the 2012 USSSA D IL State; 2003 & 2009 Joliet City; and 1999 USSSA Great Lakes National Champs! !